- Millions of pizzas are likely to be eaten this weekend - Domino's wants to give rewards points for all of them! - Domino's app will use artificial intelligence to identify pizzas and give away rewards points for the next 12 weeks. - New ads, featuring Domino's CEO in a non-Domino's pizza restaurant, will air just in time for Sunday's game. ANN ARBOR, Mich., Jan. 30, 2019 /PRNewswire/ -- Domino's Pizza (NYSE: DPZ), the largest pizza company in the world based on global retail sales, knows for a fact that people love pizza. They love pizza from Domino's and pizza they make at home, pizza from competitors and pizza on bagels. Even frozen pizza. And now, Domino's is here to celebrate all that pizza love. Beginning on Saturday, Feb. 2, just ahead of one of the biggest pizza days of the year, Domino's will begin awarding rewards points for ALL pizza that customers may eat through its new Points for Pies program. The process is simple: Customers download the latest Domino's app, sign up for the Piece of the Pie Rewards® loyalty program (if not already a member), use the newly-embedded pizza identification feature to scan their pizza and voila! Customers can then earn 10 points. After a customer earns 60 points, they can redeem them for a free medium two-topping Domino's pizza! All the details can be found at pointsforpies.com. "Instead of advertising during Sunday's game, we decided to invest in a breakthrough program that rewards everyone who loves pizza as much as we do," said Art D'Elia, Domino's senior vice president - chief brand officer. "We know everyone is asking themselves, 'Did Domino's just say they will award points for eating ANY pizza? Even from a competitor?' You read that right; oh yes we did!" Domino's typically sells nearly 2 million pizzas and 4 million chicken wings on the biggest football day of the year – about 40 percent more pizzas than on a normal Sunday. Stores have prepared for weeks so that they're ready to serve customers during the busiest hours – right before kickoff through the halftime show – some of the most intense pizza-ordering hours of the year. Considering Domino's alone sold enough pizza to cover more than 5,000 football fields last year, we know there are a lot of pizza lovers out there who will be eligible to claim rewards points! Technology is an important element of Domino's Points for Pies program. Domino's internal teams developed a pizza identifier that will scan each pizza or slice and will then use artificial intelligence-driven software to identify the image as pizza, so that points can be awarded. This technology will recognize all pizza – not just Domino's – for rewards. Sorry – it won't give points for hamburgers, turkey sandwiches or any nonpizza item. Domino's CEO, Ritch Allison, will appear in TV commercials for the program, which begin airing on Feb. 2. Not only is it the first time that Allison has been in a Domino's ad, it's also the first time a Domino's ad has been shot in a restaurant other than Domino's. "We knew that filming this commercial in a pizzeria that was clearly not Domino's would really demonstrate our commitment to awarding points for all pizza," said Kate Trumbull, Domino's vice president of advertising. "We chose a place that was special to our CEO when he lived in Atlanta – Antico Pizza, an acclaimed family-owned favorite that puts just as much love into their pizza as we do." The new ad can be viewed at youtube.com/dominos. 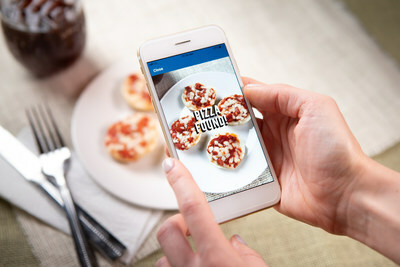 Domino's will award Piece of the Pie Rewards members with Points for Pies points when they use the latest version of Domino's mobile app to scan a "pizza or an eligible image of a pizza" from Feb. 2 - April 28, 2019. Customers can use the menu on the left-hand side of the of the app to navigate to the Points for Pies section. Domino's has committed to giving pizza lovers at least 100 million points toward free pies during the program's 12-week duration. Members can earn 10 points through scanning one pizza per week and can earn up to a maximum of 60 points through Points for Pies. Traditional rewards points, earned through pizza purchases at Domino's, can be combined with Points for Pies credits to earn a free Domino's pizza. Every day more Points for Pies credits will become available. Point availability may run out throughout the day. This doesn't mean they're gone forever, though. Customers can check back as more points become available. The mobile app will indicate when Points for Pies are unavailable and encourage participants to return later to claim points. Points earned through Points for Pies will expire after six months. Further details can be found at pointsforpies.com. For additional images, videos and other assets please go to media.dominos.com. Founded in 1960, Domino's Pizza is the largest pizza company in the world based on global retail sales, with a significant business in both delivery and carryout pizza. It ranks among the world's top public restaurant brands with a global enterprise of over 15,300 stores in over 85 markets. Domino's had global retail sales of over $12.2 billion in 2017, with more than $5.9 billion in the U.S. and more than $6.3 billion internationally. In the third quarter of 2018, Domino's had global retail sales of nearly $3.1 billion, with over $1.5 billion in the U.S. and nearly $1.6 billion internationally. Its system is comprised of independent franchise owners who accounted for over 97% of Domino's stores as of the third quarter of 2018. Emphasis on technology innovation helped Domino's achieve more than half of all global retail sales in 2017 from digital channels, primarily online ordering and mobile applications. In the U.S., Domino's generates over 60% of sales via digital channels and has produced several innovative ordering platforms, including Google Home, Facebook Messenger, Apple Watch, Amazon Echo, Twitter and text message using a pizza emoji. In late 2017, Domino's began an industry-first test of self-driving vehicle delivery with Ford Motor Company – and in April 2018, launched Domino's HotSpots®, featuring over 200,000 non-traditional delivery locations including parks, beaches, local landmarks and other unique gathering spots.